The Antarctic has long been a nightmare to study for scientists, who must endure frigid temperatures, howling winds and sea ice so thick that few dare venture there in the dead of winter. But things just got a little easier thanks to a 300 pound, autonomous underwater vehicle (AUV) that can operate for hours below the ice. In a paper published Monday in Nature Geoscience, a team of researchers said they were able to map the Antarctic ice in 3D for the first time with the help of the yellow robot named Jaguar. 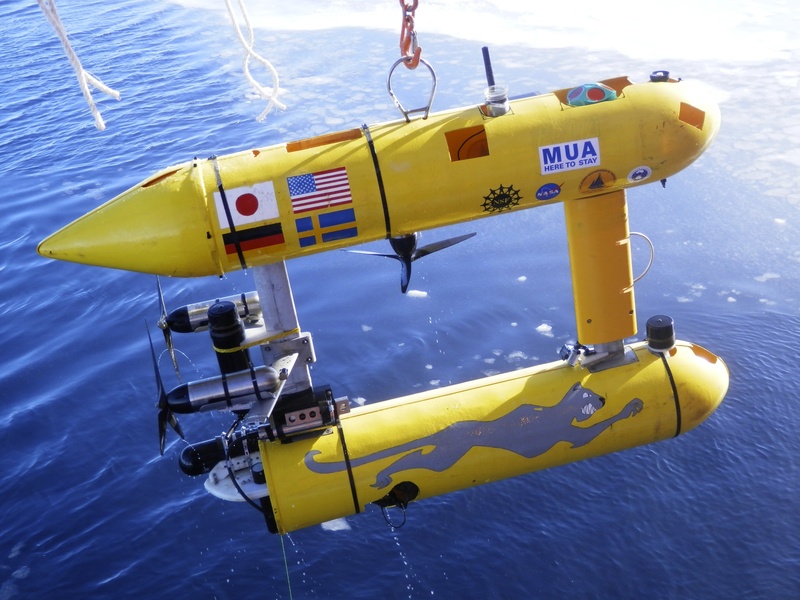 "This is really the first AUV mission where we could get detailed maps of ice. It is a lot like the advances drones have which enable people to do airborne surveys easily now," Ted Maksym, a Woods Hole Oceanographic Institution scientist and co-author of the paper. "Working with robots under water is more challenging but there have been significant advances in the technology," he said. "If you compare that to what we did in the past, we might drill 100 holes in a flow to assessment thickness. With an AUV, we are getting the equivalent of hundreds of thousands of drill holes. The amount of detail and area we can cover is really a step change from what we could do before." While there is plenty of data from the Arctic showing sea ice has receded, the picture in the Antarctic is less clear. "One of the major differences in the Arctic is that we have long-term measurements from submarines," as well as recent measurements from satellites, Maksym told CBSNews.com. "The changes in thickness there have been dramatic. The ice has thinned by 40 percent over the decades. We have pretty good picture of what changes in climate are doing to sea ice." It's a different story in the Antarctic, where scientists thought the ice was thinning, but only had incomplete data to go on. "Because we aren't able to monitor thickness of ice, we only have half picture. We can see changes in the area but we can't see changes thickness," Maksym said of the ice-breaking ships that researchers use to get to study locations can't access huge parts of the region -- which is the size of North America -- in winter. "That is where AUV work comes in." The AUV is part of a technological revolution that is allowing scientists and conservationists to use aerial and underwater drones to better understand ecosystems, combat illegal activities like poaching, and track everything from wild fires to avalanches to oil spills. The practice is far from widespread, and some experts say there are many details to work out in the U.S. and abroad. But the number of projects is on the rise, with the U.S. government turning to drones to monitor fires and hurricanes and NASA using one -- the Global Hawk Pacific Mission -- to measure trace gases and aerosols and chart the dynamics of the upper troposphere and lower stratosphere. Just last year, Google donated $5 million to the World Wildlife Fund so it can deploy a range of technologies, including drones, to help detect and deter poachers. For Columbia University Oceanographer Christopher Zappa, drones have allowed him to collect ocean and atmospheric data around Terra Nova Bay in Antarctica, a region known for its strong winds. Zappa and his colleagues were interested in studying recurring coastal polynyas -- regions where winds coming down the glacier open up the ice -- and found drones allowed them do something they couldn't do from the ship or by manned aircraft. "We have done things from aircraft, we've done stuff from ships and from drifting buoys," said Zappa, a professor at the university's Lamont-Doherty Earth Observatory. "That is OK, but there are still these extreme environments where you can't go even go with a ship to put this stuff in the water. Or no one wants to take an aircraft into a hurricane. Or they do, but they don't go where we want to go. They won't go really low. That kind of thing." In the case of the underwater SeaBED robot used in the Antarctic mapping study, it travelled like a lawnmower on a programmed route beneath the ice, sending out an acoustic pulse that hit the bottom of ice and came back to vehicle. It was programmed to return to a waiting ship and only once got lost under the sea ice, forcing researchers to cut the ice and retrieve it. The data collected from the AUV allowed scientist to conclude that sea ice was much thicker than earlier believed. "The AUV missions have given us a real insight into the nature of Antarctic sea ice -- like looking through a microscope," Jeremy Wilkinson, a co-author from the British Antarctic Survey, said. "We can now measure ice in far greater detail and were excited to measure ice up to 17 meters (56 feet) thick." While the data gives scientists greater understanding of Antarctic sea ice, Maksym said it shouldn't be misinterpreted to suggest that the region was not being impacted by climate change. It should be seen, rather, as a foundation which allows scientists to better monitor the ice into the future. "It's like going to the forest and finding more trees growing," he said. "It just means you didn't count the right of number of trees before. Just because it is thicker than we may have thought before doesn't tell us whether it is getting thicker over time."